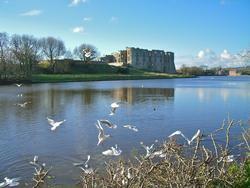 Carew Castle in south Pembrokeshire. Pembrokeshire has a wealth of castles and fortified buildings.These range in size from the magnificent Pembroke Castle to small fortified houses. They all date from Norman times and were built to keep the marauding Welsh from the more fertile lands in the southern part of the county which was settled by the Normans, Flemmish peoples and English. This large castle is situated beside a mill pond on a branch of the upper River Cleddau. It was once a grand Elizabethan mansion which was abandoned in the late 1600;s. The near by Tidal Mill uses the power of the tide to grind corn. Both the Castle and the Mill are now owned and managed by the Pembrokeshire National Park Authority. To the east of the car park is an intricately carved stone Celtic Cross, one of only three in the county. Situated in the north, Cilgerran Castle was built in a commanding position overlooking the River Teifi. The present triangular shaped castle was built around 1220. It has had a colourfull past and has changed hands several times. It is now managed by Welsh Historic Buildings Agency - CADW. 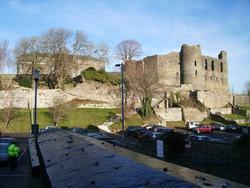 Haverfordwest Castle is in the centre of the town. The remains of this castle dominate the lower town. It was built on a bluff of land overlooking the Western Cleddau river at a point which was the limit of navigation from the sea. Impressive from the outside, little remains other than the outer walls. Oliver Cromwell ordered the destruction of the castle in 1648, but the demolition was not a success. Parts of the castle were later converted into a prison. This prison building now houses the County Archives. A small bow fronted building inside the outer keep of the castle now houses Haverfordwest town museum. Situated approximately one mile east of Pembroke, the extensive remains of the palace were once the country retreat of the Bishops of St.David’s. The palace was built between the 13th and 16th centuries with different Bishops adding wings and halls and chapels. The buildings fell into disrepair.The buildings are now under the management of CADW. The Palace is reputedly haunted by various ghostly spirits including a headless Earl of Essex and singing nuns. This impressively situated castle overlooking the Eastern Cleddau, was once a fortified Bishops Palace, rather than a true castle. There are very imposing remains of the outer gatehouse and the outer wall on the south side gives superb views from the battlements. The site is presently managed by CADW. A rectangular castle in a spectacular setting overlooking Manorbier beach. It has well preserved corner towers, gatehouse and chapel. Good views over the beach and coastline from the spur tower. There is an historical display with life sized figures in the castle. Not much remains of this rectangular shaped castle. The towers and outer walls have been recently renovated. The castle and grounds are open to the public. 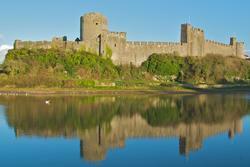 Pembroke Castle, birthplace of Henry VII. Built in the 13th century, Picton castle in situated in some 40 acres of glorious woodlands and gardens. It has been owned by the same family since the 15th century. The castle grounds are famed for their collection of rhododendrons and azaleas. The garden contains a maze, a fern walk and a collection of unusual shrubs and trees. recently a restaurant has been opened in the castle. The remains of the Bishops Palace are located in the grounds of the present Cathedral. The palace was built when the Normans arrived in Pembrokeshire. The Norman’s appointed their own Bishop in place of the native Welsh Bishop when they took over the Cathedral in the 11th century. They initially built a simple motte and bailey fort which was subsequently replaced by a stone defensive wall around the cathedral and the palace. The palace was added to and altered over the years by the various Bishop’s. It fell into disrepair after the reformation. Dramatically situated on top of Castle Hill and almost surrounded by the sea, only a small tower now remains.The approach to Castle Hill is through the remains of the Castle gateway. The town walls surrounding the old town of Tenby are believed to the best preserved town walls in south Wales. Inside the walls is a maze of narrow streets. The Tudor Merchants House close to the harbour and Castle Hill, is open to the public and is now owned by the National Trust. Tenby Museum and Art Gallery is situated on Castle Hill.